Nassington skipper Alex Laud is expecting success to breed success. The village club picked up their first major trophy in seven years when lifting the Jaidka Cup with a 24-run win over Market Deeping in the final and five days later added a second when beating Uppingham in the final of the Stamford Charity Cup. That’s 11 wins in 12 Twenty/20 matches this summer for the Knights and they still have their eyes on more glory. 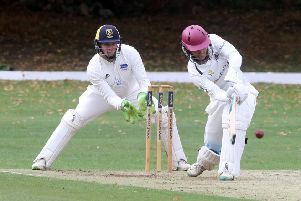 They have a Stamford KO Shield semi-final on Monday (July 6) against King’s Keys, a team they beat by just two runs in a John Wilcox Trophy quarter-final last weekend. Nassington are also fourth in Cambs Division One despite losing a low-scoring game to new leaders Wisbech last weekend. “Things have gone well for us this season,” Laud stated. “To win the Jaidka for the first time was very pleasing and it should be the catalyst for more success. “We have a good side and we are all enjoying our cricket, but we want to win more cups. Nassington’s form has attracted the attention of bigger clubs and Craig brothers Harrison and Conor look set to be transfer targets for some. Harrison (15) took 5-9 in the Jaidka Final to spark a Deeping collapse from 74-0 to 112 all out. Gary Freear (7-25) returned career-best bowling figures as Wisbech beat Nassington by 24 runs last Saturday. And Nassington came close to a shock defeat against King’s Keys 24 hours later, but just managed to defend 104 despite 54 from Ansar Hussain. Oundle crushed Wisbech by 239 runs and Stamford pipped Isham by just three wickets in the other Trophy quarter-finals. Oundle piled up 328-7 in their 50 overs with Jack Bolsover (72) leading the way. Wisbech totalled just 89 in reply with Joe Charlton claiming 5-20. Oundle now host Nassington in the semi-finals on July 26 when Ufford Park will entertain Stamford in the other last four clash.